Featuring Government, Municipal, Repo, Bankruptcy, Seized, Fleet, & others. 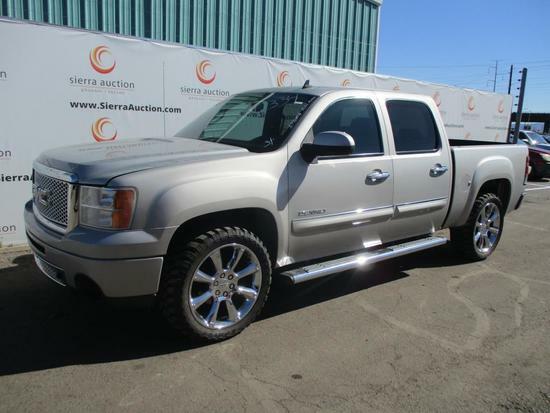 Sierra Auction - Arizona's Largest Public Auctions - Multiple Monthly Auction Events for Vehicles, Commercial EQ & more! Sales Tax : 8.6% - Sales tax applied to invoice total, including Internet Premium. Payment Instructions: IMPORTANT PLEASE READ PROXIBID $100-$500 REGISTRATION DEPOSIT HOLD: If you, the buyer, register for any of our auctions through Proxibid and DO NOT meet the Marketguard criteria for bidding we require either a $100 deposit hold (Firearms ONLY) or a $500 deposit hold (Vehicles & Equipment) in order to participate in our auctions. This registration deposit hold is NOT available as part of the purchase and will be released upon either payment in full, or if you are a non-winning bidder in the auction. This can take up to 30 days depending on YOUR bank to release. If you ARE the winning bidder of an item in auction and payment has not made according to Sierra’s terms and conditions, the $100-$500 registration deposit hold will be charged as a penalty for breaching the purchase contract. Please make sure to familiarize yourself with all of our terms and conditions. SIERRA AUCTION DOES NOT AUTOMATICALLY CHARGE CREDIT CARDS ON FILE ------------------------------------------------------------------------------- Tiered Buyer's Premium Up to $499 = $75 $500 - $999 = $125 $1000 - $1499 = $195 $1500 - $1999 = $295 $2000 - $2999 = $395 $3000 - $3999 = $495 $4000 - $4999 = $595 $5000 - $5999 = $695 $6000 & above = 12% Buyer's Premium ------------------------------------------------------------------------------- 1. “Tent Lane / Passenger Vehicles” vehicles - are driven through the auction sale area at a very slow speed so that buyers can better determine vehicle value by listening to the engine and visually seeing the vehicle run. Under no circumstances does Sierra warrant that these vehicles are free from defects in the engine, transmission, or drive train. It simply allows the buyer to have a level of confidence that the vehicle can move forward/backward. 2. “Selling Stationary” vehicles - are sold with a key and have been deemed unsafe to be driven or undrivable, but do start either on their own or through the use of a battery jump start. 3. “Non-Runner” vehicles - are those vehicles sold with or without a key and cannot be started. Vehicles in this category could include engine problems, missing parts, collision vehicles, or virtually any other issue that would cause a vehicle to be a non-runner. ALL Vehicles Are Sold “AS IS WHERE IS” ------------------------------------------------------------------------------- Additional Fees May Apply - See Our Special Terms Of Sale Below Credit Card Payments - Additional Fees May Apply - See Our Special Terms Of Sale Below TERMS •	Must sign a Credit Card Chargeback Waiver •	Credit Card MUST be present and swiped •	Must have a Valid ID that will be copied •	Address of Credit Card and ID must be the same Sierra reserves the right to require the purchaser(s) to make a $100 refundable deposit. In the event the Buyer fails to place the required deposit or make final payment of items won, Sierra, in its sole and exclusive judgment, may declare the buyer in breach of contract, retain the deposit and bar the Buyer and Buyer's agents from all future auctions. Renege Fees - Vehicles Renege Fee: Minimum $500 or a 14% of the total bid price, whichever is greater. - Heavy/Commercial Equipment Renege Fee: Minimum $500 or a 14% of the total bid price, whichever is greater. - Firearm Renege Fee: Minimum $200 or a 17% of the total bid price, whichever is greater. - Surplus / DOR Renege Fee: Minimum $200 or a 14% of the total bid price, whichever is greater. (Fee must be paid to be able to bid at in our auctions again) Upon a successful bid using the Proxibid online system, Sierra Auction reserves the right to IMMEDIATELY charge your credit card the deposit of $100.00 to hold your bid until full payment is made. Sierra Auction reserves the right to charge your credit card up to $500 or 14% of the invoice amount if a buyer refuses to pay total invoice. All Non-Vehicle related internet purchases will charged to the Credit Card on file, after the Sierra Auction invoice has been issued. All Vehicle/Heavy Equipment related internet purchases must be made via wire transfer or paid in person in cash or cash equivalent (cashier's checks, wires, bank transfers, debit card*, at Seller's discretion). All payments must be received by Sierra Auction no later than the One Business Day immediately following the date of the auction. Sales Tax will be charged on all purchases, unless seller has been provided with a valid and legal Resale Tax License and completed Arizona Form 5000 Tax Exempt Certificate. Any Invoice Total over $1,000 will have to be paid with Cash or cash equivalent (cashier's checks, wires, bank transfers, debit card*, at Seller's discretion). Firearm purchases are excluded from this limit. You will receive an Invoice From Sierra Auction with Instructions. If you are unsure of our payment policy, please don't hesitate to contact our office prior to bidding. Shipping Instructions: It is the customers responsibility to load out and remove all items from a Vehicle or Commercial Equipment auction event. If you need to transport a vehicle, please contact a third party vendor. Your shipper is responsible for the vehicle's condition after loading and removal from Sierra's lot. Please be sure to communicate with your shipping company to ensure a smooth transition. Preview Date & Times: In person preview held on Friday, [Insert_Date], from 8am to 5pm (Arizona Time). Checkout Date & Times: All Purchases must be removed withing 2 Business Days immediately following the auction date. Driving Directions: From I-10: Take I-17 North to Indian School Road Exit, Proceed West approximately 1.5 miles to 35th Avenue North Exit. Immediate left on to Monterosa Drive, follow until it dead ends (approximately 1/10 mile). By participating and/or bidding in any of our auctions, live, onsite, or online, you are agreeing in full to our Terms and Conditions and Fee Structure here at Sierra Auction. If you have questions or comments regarding any of our Terms and Conditions or Fee Structure please call 602.242.7121 to discuss. To view our current Terms and Condition and/or our Fee Structure Online, please visit one of the links below. Per City Code 2-132, if you are a City of Phoenix employee, your are not permitted to bid on any City of Phoenix assets, either knowingly or unknowingly. By participating in our auction you are certifying that you are aware of this code and will abide by it. Terms and Conditions http://sierraauction.com/pages/buyer/terms-and-conditions/ Fee Structure http://sierraauction.com/pages/buyer/fee-structure/ SIERRA AUCTION DOES NOT AUTOMATICALLY CHARGE CREDIT CARDS ON FILE ------------------------------------------------------------------------------- Tiered Buyer's Premium Up to $499 = $75 $500 - $999 = $125 $1000 - $1499 = $195 $1500 - $1999 = $295 $2000 - $2999 = $395 $3000 - $3999 = $495 $4000 - $4999 = $595 $5000 - $5999 = $695 $6000 & above = 12% Buyer's Premium ------------------------------------------------------------------------------- 1. “Tent Lane / Passenger Vehicles” vehicles - are driven through the auction sale area at a very slow speed so that buyers can better determine vehicle value by listening to the engine and visually seeing the vehicle run. Under no circumstances does Sierra warrant that these vehicles are free from defects in the engine, transmission, or drive train. It simply allows the buyer to have a level of confidence that the vehicle can move forward/backward. 2. “Selling Stationary” vehicles - are sold with a key and have been deemed unsafe to be driven or undrivable, but do start either on their own or through the use of a battery jump start. 3. “Non-Runner” vehicles - are those vehicles sold with or without a key and cannot be started. Vehicles in this category could include engine problems, missing parts, collision vehicles, or virtually any other issue that would cause a vehicle to be a non-runner. ALL Vehicles Are Sold “AS IS WHERE IS” ------------------------------------------------------------------------------- VEHICLES: $45-$60 Administration fee per vehicle/heavy 2% additional fee for bidding online is applied per lot (min. $50) 8.6% Sales Tax (if applicable) applies to bid price and Buyer's Premium Acceptable Payment methods Cash, Cashier's Check, EFT into one of our three major banks (Bank of America, Wells Fargo, Chase). Credit Cards are accepted, certain restrictions and fees do apply Credit Card Payments - Additional Fees May Apply - See Our Special Terms Of Sale Below TERMS •	Must sign a Credit Card Chargeback Waiver •	Credit Card MUST be present and swiped •	Must have a Valid ID that will be copied •	Address of Credit Card and ID must be the same If you make a bid error you must contact Proxibid before the start of the live auction to have your bid removed at 1-877-505-7770 We have a few rules that we all must follow to insure that everyone has a safe and enjoyable auction experience. Sierra Auction Management, Inc. ('Sierra') is acting as an auctioneer-agent for many cities, counties, the state of Arizona, many large and small companies and people just like yourself that are seeking to sell items they no longer need. Sierra may act as a Principal, Buyer or Seller in the sale of some items. Sierra is not responsible for the actions of its consignors and/or principals. SIERRA AUCTION MANAGEMENT, INC. ('Sierra') Auction Terms & Conditions AUCTION AGREEMENT: By participating as a live or online bidder, you are agreeing to all of our terms and conditions contained hereinafter as well as our fee structure. If you disagree with any of these terms, you are not permitted to bid through any Sierra Auction hosted auction event in any location. ATTENTION: Per City Code 2-132, if you are a City of Phoenix employee, you are not permitted to bid on any City of Phoenix assets, either knowingly or unknowingly. By participating in our auction, you are certifying that you are aware of this code and will abide by it. Sierra reserves the right to change these terms and conditions at any time at its sole discretion and without notice. Recording of the auction is strictly prohibited; no still, video or audio recording can be made without the express written permission of Sierra. No firearms allowed pursuant to A. R. S. section 4-229. Sierra Auction Management, Inc. (“Sierra”) is acting as an auctioneer-agent for many cities, counties, the State of Arizona, many large and small companies and people just like yourself that are seeking to sell items they no longer need. Sierra may act as a Principal, Buyer or Seller in the sale of some items. Sierra is not responsible for the actions of its consignors and/or principals. A Valid ID is required to register, pay, and pickup at all Sierra Auction locations. REGISTRATION: All Buyers must register and be assigned a bidder number prior to bidding. Sierra reserves the right to deny access to its premises to any buyer, visitor, or guest at its sole discretion. Sierra may revoke any bidder’s rights to bid at any Sierra auction, or all future Sierra auctions at its sole discretion. You are responsible for all purchases made with your number, whether it was made by you, someone you’ve given the rights to use your number, or by error. DEPOSITS: Bidders may be required to place a refundable deposit for any assets being sold by Sierra Auction. Your deposit will be refunded to you upon full payment for your purchases or may be applied to the payment of your purchases. If you have made a purchase of multiple items, your deposit will be held and may be used for the last item(s) left unpaid. If you did not win any bids, your Cash Deposits WILL be refunded in cash the day of auction ONLY. If you did not collect your cash deposit on the day of auction your deposit will then be refunded by check within 15 business days. The check will be mailed to the address on file. Cash deposits are refunded to registered bidder only, upon presentation of a valid bidder card and ID. A Credit Card deposit is presented to your bank as a pre-authorization/sale and will drop off per your credit card’s terms for pre-authorizations/sales. Please check with your bank or credit card issuer if there are any issues. Please Note: Credit Card and/or Debit Card pre-authorizations/sales and refunds can take up to 30 days. Sierra reserves the right to require the purchaser(s) of certain lots to make an additional deposit, within 30 minutes of Sierra’s request, at Sierra’s sole and exclusive judgment. In the event the Buyer fails to place the required deposit, Sierra, at its sole and exclusive judgment, may declare the buyer in breach of contract, and re-auction the lot, and bar the Buyer from future bidding. Buyer will forfeit their deposit, and be liable for any loss or other cost the consignor and/or Sierra incurs in re-auctioning the lot. Per the Terms and Conditions of the Bidder Contract you authorize Sierra (Auctioneer) to retain your deposit in the event you fail to pay for the items you purchased. If you do not pay for all the items for which you were the successful bidder by 3:00 PM of the 3rd calendar day following the auction, Auctioneer retains all it rights to charge late and storage fees and bidder will be liable for all costs and losses suffered due to Bidder breach. Auctioneer retains the right to sue Bidder for specific performance for Bidder’s breach of contract. PROXIBID $100-$500 REGISTRATION DEPOSIT HOLD: If you, the buyer, registers for any of our auctions through Proxibid and DO NOT meet Proxibid’s Marketguard© criteria for bidding, Proxibid will require either a $100 deposit hold (firearms ONLY) or a $500 deposit hold (vehicles & commercial equipment) in order to participate in our auctions. This registration deposit hold is NOT available as part of the purchase and will be released upon either payment in full or if you are a non-winning bidder in the auction. This can take up to 30 days depending on the time it takes YOUR bank to release. If you ARE the winning bidder of an item in auction and payment has not made according to Sierra’s terms and conditions, the $100-$500 registration deposit hold will be charged as a penalty for breaching the purchase contract. Please make sure to familiarize yourself with all of our terms and conditions. BUYER’S PREMIUM: The Buyer’s Premium is specified in the special terms and conditions and also within our fee structure. You are responsible for reading, understanding, and accepting Sierra’s current fee structure listed in the catalog and on our website for those fees specific to the auction in which you are participating. TAX EXEMPTION QUALIFICATIONS: All sales are subject to all Local, State, County, and Federal Taxes, including sales taxes unless you have ALL VALID FORMS on file with Sierra PRIOR to the auction. Forms include but are not limited to: (1) Sales Tax Exemption Certificate(TPT) acceptable to Sierra and to the State of Arizona, (2) COMPLETED Arizona Form 5000, and (3) a separate automobile dealer exemption certificate/license if you purchased a titled asset. (4) Letter of Authorization, if you are not the company owner. You will not be granted tax exemption post-sale if these forms are not completed to the satisfaction of Sierra. OTHER FEES: Sierra charges additional fees as specified in the current fee structure listed in the special terms and conditions. It is the Buyer’s responsibility to be familiar with these fees. You have agreed to them by participating in our auction. Renege Fees Vehicles Renege Fee: Minimum $500 or a 14% of the total bid price, whichever is greater. Heavy/Commercial Equipment Renege Fee: Minimum $500 or a 14% of the total bid price, whichever is greater. Firearm Renege Fee: Minimum $200 or a 17% of the total bid price, whichever is greater. Surplus / DOR Renege Fee: Minimum $200 or a 14% of the total bid price, whichever is greater. (Fee must be paid to be able to bid at in our auctions again) AUCTION TERMINOLOGY: It is the responsibility of the bidder to understand the manner in which items are being sold. THE BIDDER MUST UNDERSTAND WHAT HE/SHE IS BIDDING ON AND HOW IT IS BEING SOLD; IF NOT, ASK OR DO NOT BID! BIDDER ERROR: NO REFUNDS FOR BIDS MADE IN ERROR. Operator error, keystroke mistakes, misunderstanding of auction structure, and other are bidder’s sole responsibility. PAYMENTS: All payments are to be made in U.S. funds. A DAILY LATE PAYMENT FEE shall be charged on all lots not paid for in full by 3:00 PM on day payment is due. Refer to special terms and conditions per auction for payment due dates. The DAILY LATE PAYMENT FEE SHALL BE equal to 3% of the outstanding balance of each lot or $10 per lot, whichever is greater. Any lot not paid for by 3:00 PM on the specified payment due date shall place the Buyer in breach of contract. Sierra retains all its legal rights, including, but not limited to suing Buyer to compel specific performance, and/or declaring the Buyer in breach of contract retaining the deposit and barring the Buyer and Buyer’s agents from all future auctions. Sierra, at its sole discretion may offer the goods for sale in a private sale or any future Sierra auction. Buyer shall be responsible for any deficiency, including late payment fees and storage fees. Buyer shall have no right to any excess funds such sale may generate. Sierra reserves the right to require certain Buyers or certain lot purchasers to pay cash only. Sierra reserves the right to change the fee structure, refuse to accept certain credit cards, and/or require cash payments in its sole discretion. SIERRA DOES NOT ACCEPT PERSONAL OR BUSINESS CHECKS FOR PAYMENTS. CREDIT CARDS ARE LIMITED TO A MAXIMUM OF $3,000 ACCEPTABLE FOR PAYMENT TOWARDS VEHICLE & COMMERCIAL EQUIPMENT PURCHASES. ONLINE CREDIT/DEBIT CARD PAYMENTS ARE NOT ACCEPTED FOR TITLED ASSETS THRU OUR PAYMENT GATEWAY. Requirements to use Credit Care are: card holder MUST be present, credit card being used must be present and WILL be swiped, card holder MUST provide valid ID, and a Credit Card Chargeback Agreement MUST be completed. SIERRA AUCTION DOES NOT AUTOMATICALLY CHARGE CREDIT CARDS ON FILE ANNOUNCEMENTS: Any announcements made by Sierra staff or auctioneers on the day of the live/online simulcast auction shall take precedence over any previously distributed information or advertising. By participating in the auction, you have agreed to abide by these announcements. ADDITION TO OR WITHDRAWAL FROM SALE: The auctioneer reserves the right to withdraw from the sale any property listed and also to add property not listed to the sale. Also, the auctioneer may group lots or subdivide lots in order to benefit the seller. ALL SALES ARE FINAL. ALL ITEMS ARE SOLD 'AS IS-WHERE IS,' WITH ALL FAULTS AND WITHOUT WARRANTIES. Catalog, web, and ad descriptions are NOT GUARANTEED. Sierra is not liable for any errors, omissions, or inaccuracies in the catalog or other written or verbal descriptions even if caused by Sierra’s gross negligence. Bidders are responsible to thoroughly inspect items before bidding and to satisfy themselves of such matters as to suitability, marketability, completeness, year, make, model, and/or condition. IF YOU ARE UNSURE AS TO ANY MATTER, SIERRA URGES YOU NOT TO BID. YOU MAY NOT RELY ON SIERRA’S DESCRIPTIONS OR INFORMATION, WRITTEN OR VERBAL. The auctioneer reserves the right to reject any and all bids. The auctioneer shall have the right to bid on behalf of the seller. It is your responsibility to bid up to a number with which you are comfortable. You control how much you are willing to pay for an item. All auction sales will be recorded by audio and/or in writing. This recording of the bidder’s number and the bid amount shall be prima facie evidence of the circumstances of the sale, and all disagreements will be resolved with this record. Please clearly show your bidder number to the auctioneer. Please confirm the auctioneer correctly states your bidder number and the final bid amount. Sierra is not responsible for any loss or damage to any sold auction items. Title (ownership) and risk of loss or damage transfers to Bidder as soon as each individual lot is sold, subject only to Sierra’s right to reconcile the auction. Errors by auctioneer shall make the sale voidable at auctioneer’s sole discretion. Sierra is not responsible for accidents, damages or stolen goods. All counts are approximate. Purchaser should monitor their purchases during the auction; if it is damaged or missing it is the bidders’ responsibility. Sierra urges all Bidders to remove all lots from the auction site as soon as possible and no later than the close of business on auction day, with safety and security as the top considerations. ABSOLUTELY NO REFUNDS. REMOVAL OF PURCHASED ITEMS: SIERRA DOES NOT OFFER STORAGE SERVICES. No item may be removed from the auction site until it is paid for in full and partial payments will be considered additional non-refundable deposits towards the purchase. To avoid daily storage fees, all lots must be removed from Sierra’s facility on the date specified in the special terms and conditions. In certain situations, Sierra, in its sole and exclusive judgment, may allow certain lots Sierra deems difficult to move to be removed on date mutually agreed upon. A DAILY STORAGE PENALTY of $5.00 per lot, per day for non-titled lots, and $20.00 per day for any lot that has a title shall be charged for all lots not removed on specified removal date. Lots larger than a standard pallet shall be charged $5.00 per day for every 15 square feet of storage space utilized. Any item not removed within 72 hours following the removal date or the mutually agreed upon date will become the property of Sierra, WITHOUT EXCEPTION. Any unsalable items that are not removed will be disposed of at the Buyer’s expense, typically $25 per lot or partial lot. Buyer is solely responsible for the safe removal of all their purchases. Sierra, at Buyer’s request, and in its sole discretion, may assist Buyer in the removal of its goods. Buyer may be charged Sierra’s current hourly rate per workman and forklift or other equipment utilized. In the event any work is requested after 3:00 PM or on non-standard Sierra workdays, Sierra may charge Buyer 1.5 times its standard hourly rate. Buyer shall hold Sierra, its employees, officers and directors harmless for any and all damage, injury or liability regarding the removal of its purchases, notwithstanding Sierra assistance in item removal. All lots and purchases must be removed in full. No removal of partial lots shall be allowed; inquire about shipping options. INJURY: All persons attending our live or on-site auctions are notified that an auction site is a potentially hazardous place. Flammable, noxious, corrosive and pressurized substances are present, heavy equipment is being operated and electric circuits may be live. Every person at the auction site before, during and after the sale shall be deemed to be there at his or her own risk with notice of the condition of the premises, the activities on the premises, and the conduct of third parties. All registered bidders shall so advise their guests, agents, and employees. NO PERSON(S) SHALL HAVE ANY CLAIM AGAINST SIERRA, ITS EMPLOYEES, AGENTS, AUCTIONEERS, CONTRACTORS, OFFICERS, OR PRINCIPALS FOR ANY INJURIES SUSTAINED, OR FOR DAMAGES TO OR LOSS OF PROPERTY OR PROFIT WHICH MAY OCCUR FROM ANY CAUSE WHATSOEVER. No Children under the age of 13 are permitted on property. Persons attending during preview, exhibition, sale, or removal of goods assumes all risks of damage of or loss to persons and/or property and specifically releases the auctioneer from liability therefore. Neither the auctioneer nor his principal shall be liable by reason for a defect in or condition of the premises on which the sale is held. SELLER CONFIRMATION AND UNRESERVED ITEMS: Sierra’s policy allows our consignors to determine if they wish to place a minimum bid or “Seller’s Confirmation” on any lot. Not all reserved items are noted in the description – auctioneers are given the authority to bid on behalf of the seller. You and you alone as an auction participant determine what you are willing to pay for all assets. Please stop bidding if you feel you have reached your maximum comfort level. All other lots will be sold to the highest bidder. However, Sierra reserves the absolute right, at its sole and exclusive judgment, to withdraw any lot from sale, or add new lots to the sale at any time up to the item being declared sold. TITLES AND 3-DAY TEMPORARY VEHICLE TAGS: In some instances, Repossession Affidavits or court documents will be given in lieu of a title. These documents allow a buyer to obtain a valid title at any state authorized title agency. Computers with internet connection are supplied for the purchase and printing of temporary vehicle tags. A $1.00 user fee (subject to change) per 3-day tag is due immediately and payable by credit card or debit card ONLY. ARBITRATION: In the event a dispute shall arise between the parties, it is hereby agreed that the dispute shall be referred to an accredited arbitration service at the sole discretion of Sierra. Arbitration shall be in Phoenix, AZ, and held in accordance with the applicable Rules of Arbitration. The arbitrator’s decision shall be final and legally binding and judgment may be entered thereon. Each party shall be responsible for its share of the arbitration fees in accordance with the applicable Rules of Arbitration. In the event a party fails to proceed with arbitration, unsuccessfully challenges the arbitrator’s award, or fails to comply with the arbitrator’s award, the other party is entitled to costs of suit, including a reasonable attorney’s fee for having to compel arbitration or defend or enforce the award. BY PARTICIPATING IN ANY OF OUR AUCTIONS I (the customer) UNDERSTAND AND ACCEPT THE ABOVE TERMS AND CONDITIONS, ESPECIALLY THE KEY TERMS THAT ALL ITEMS ARE SOLD AS IS, WHERE IS, WITH NO GUARANTEES OR WARRANTIES. I AM SOLELY RESPONSIBLE FOR DETERMINING THE IDENTIFICATION, CONDITION, AND/OR USE OF ALL ITEMS PURCHASED. REFUNDS WILL NOT BE ISSUED AS A RESULT OF ANY DESCRIPTIVE ERROR GIVEN BY THE AUCTIONEER OR AS A RESULT OF MY FAILURE TO PROPERLY IDENTIFY THE ITEM, ITS CONDITION OR USABILITY. I ACKNOWLEDGE THAT SIERRA IS NOT LIABLE FOR ANY INJURY OR LOSS TO MY GUESTS OR ME. Please Note: All Credit Card Charges/Debit Card Charge Can Take Up To 30 Business Days for Refunds. You've been outbid to K****2! to YOU! You've been outbid to W****8! to YOU!